Khufu has that typical sweet flavor of original Kush cannabis seeds, it was named after the 1st pyramid builder Khufu. Khufu is crossed between a San Fernando Kush male and our very own Kuchi female. Build your own (weed) pyramids just like that ancient ruler for whom this strain is named after… calyx upon calyx is layered to produce a massive yield which can satisfy even the most discriminating of Kush fans. While we were coming up with any ideas for our new experiment we took our already vigorous Kuchi (SFV Kush x Exodus Cheese), and then decided we would like to find an even stronger cross. Searching for that ideal donor we made the decision to backcross a Kuchi male with a San Fernando Valley OG Kush female. (in an amazing three-way cross) in order to concentrate the most secure and hard-hitting Kush elements – the stuff that legends are made of. The results of the cannabis buds will leave you feeling instantly chilled and somewhat talkative and has a sweet flavor which has often been described as being alike to sage with a dash of citrus. Consisting of one part Cheese to two parts Kush, the Exodus Cheese still manages to keep its own and contribute to a massive chunk of the flavor. The aroma has a delicious hint of coffee which it has retained from the San Fernando Kush. Little and dense, this marijuana plant doesn’t look like most Indica’s, even slightly sativa (some phenotypes are even likened to Haze in both appearance and flavor), but she is very much an Indica, and a very strong one at that.This strain will produce tight potent Kush nuggets and it is spot on for anyone that wants to maximize a limited growing space.It is only available in non-feminized, growers that want to grow mother plants or experiment with their own crosses will also value Khufu for her vigorous and varied genetics. The 3-way cross presents the biggest number of varying phenotypes and for any grower seeking something a little different out of the age-old classic. The strong body stone will be alike to Kush fans everywhere; This is perfect for an evening to relax and chill, and will give the user a real deep and heavy stoned feeling which will leave you smoking like the flames of hell. Mekong High x Critical MassWhat do you get when Dr Krippling crosses a strain originating from the j..
Quick One is a fast-growing autoflowering strain. 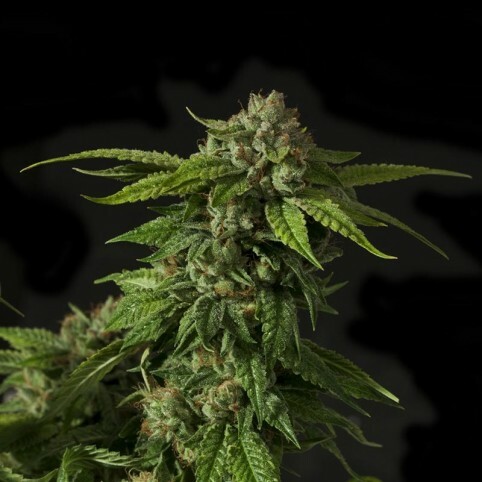 This was one of the first autoflowering strains de..